Besides the usual Holiday show down of december, and the fun of january. 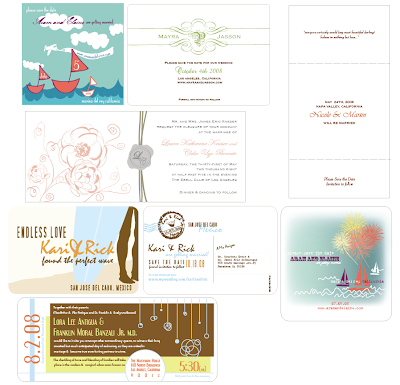 I have been crazy with new wedding clients fun design requests. hence the lack of blog updating. I had all intentions of completing some personal projects this last month but I just can't seem to find the time or moo-la. As things start picking up and some projects get completed I can start to save for some personal cards and other crafts. Here is a little collage of projects and ongoing designs for a few brides. Once they are printed I will be taking photos and posting them. Some will be letterpress others will be Inkjet. It is a lot of fun taking a brides inspiration and vision and turning it into a fun invite or save the date that represents their style and theme of their wedding. Some grooms are actually way into as well.